On 18 December at 17.00, RIGA GALLERY invites to the opening of the exhibition “Public and Private” by Ritums Ivanovs, featuring the official portrait of Valdis Zatlers, the former President of Latvia. The popular new-generation painter and experienced portraitist Ritums Ivanovs has been commissioned to paint the official portrait of the former President of Latvia Valdis Zatlers. Working on the official portrait of Valdis Zatlers, Ivanovs has returned to the classical oil painting technique and painted according to the canons of the grand style portraiture. Viewers accustomed to Ivanovs’ original hatching manner will be surprised – Valdis Zatlers’ face painted in the academic tradition has been worked out up to the smallest details and all official insignia are also recognisable. This approach fully conforms to the rules set by the President’s Office and a special commission, and continues the painter Miervaldis Polis’ style, representing the former Presidents of Latvia Vaira Vīķe-Freiberga and Guntis Ulmanis. 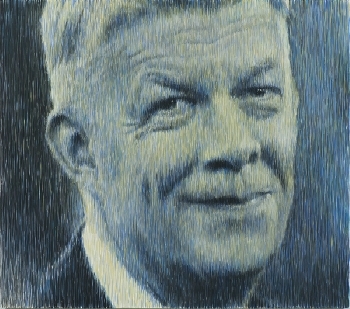 The second portrait of Valdis Zatlers will surprise the public yet again, as it is executed in Ivanovs’ unique painting manner – barcode-type hatching that symbolises the present-day digital era. In this portrait, the artist has given up the official insignia and aimed at revealing of the former President’s character in a more personal tone. 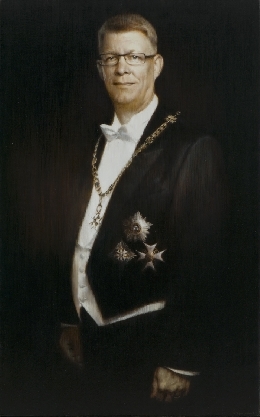 This portrait is more similar to the portrait of Jānis Čakste by Ivanovs which is the property of Saeima, the parliament of Latvia, and is exhibited in its premises. The exhibition will be on view at Riga Gallery from 18 to 20 December, opening hours: 12.00–18.00, Aspazijas Blvd 20, Riga. Ritums Ivanovs was born in Cēsis / Latvia in 1968. In 1994 he graduated from the Painting Department of the LatvianAcademy of Art. In 1994–1995 he studied at the Humboldt State University, California / USA. He was the only contemporary Latvian artist (together with Līga Purmale) to participate in the Sotheby’s exhibition in London 2009.